The annual conference of Bangladesh Human Rights Defenders Forum (BHRDF) was held in Rangpur NGO Forum Hall room on Saturday. Members of the CAUCUS Executive Committee of Rangpur, Dinajpur, Nilphamari, Lalmonirhat, Kurigram, Jessore, Rajshahi and Satkhira Districts were present in the conference. Presided over the conference, the President of the Central CAUCUS Mr. Moshfiqa Razzak, President of Rangpur Press Club, Bir Freedom Fighter Sadrul Alam Dulu, represented the News Network, Mr. Shahiduzzaman, Editor and Chief Executive Officer of the organization and Mr. Alauddin Ali, Executive Director, Udayankur Services Agency (USS). 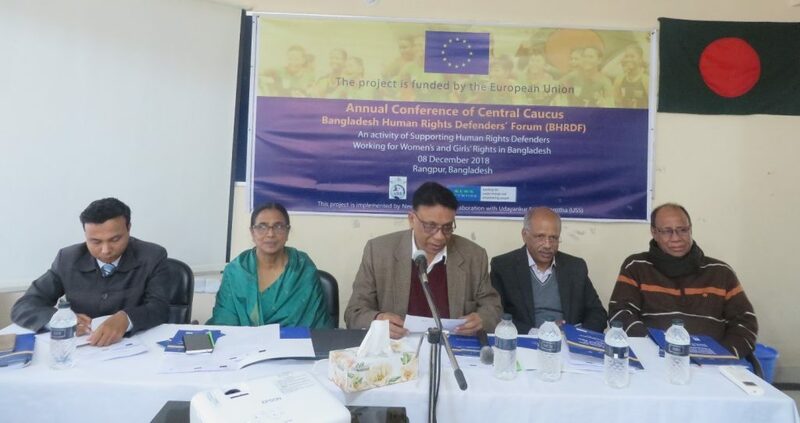 Presenting the keynote paper titled “Protection of human rights activists in Bangladesh” at the conference, Acting member of the Rangpur District Caucus, lawyer and human rights activist, AAM Munir Chowdhury. Firozha Begum Lalmonirhat, Firoz Alam, Chanalal Bakshi and Laili Begum Kurigram, Sarwar Manik, Meherunnesa and Miladur Rahman Mamun Nilphamari, Chitta Ghosh Dinajpur, Jamaluddin Jessore and Nazmul Haq Satkhira participated in the discussion on the main article. If the BHRDF draft constitution is presented in the conference, it is unanimously approved without any amendment.